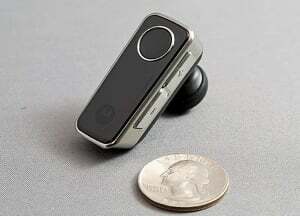 Miniature Bluetooth Headsets seem be flooding the market and Motorola isn’t being left out in the snow. The performance of the Motorola H680 ($59.95) might be blazing a trail for the other smaller headsets to follow. The Motorola H680 measures just over 1.5 inches long and weighs in at a hefty .42 ounces. The headset feels solidly built and even if though the H680 s under half an ounce, it feels heavier compared to other mini-BT headsets. It comes packaged with an assortment of ear buds and hooks, charging cradle and Quick Start Guide. The tiny headset has four controls; a call button (upper center of the face of the headset), large volume keys (located on the side), and an on/off button (located at the top of the headset). The larger buttons are a welcomed sight and personally, I like the dedicated on/off switch. The charging cradle is somewhat unique in that the H680 is held into place with magnets. The cradle comes with a clear cover that can give your H680 some shelter while charging or used to raise the platform of the cradle. It is the only charging option for the headset. When first turned on, the H680 goes into pairing mode and it took no time at all to pair the headset with my Samsung BlackJack II. The H680 connected exceptionally well with the phone with no static, interference or distortions experienced. Call volume was really good and the microphone picked up my voice using a normal tone and volume. The microphone also filters out background noises really well. The H680 comes with a detachable ear hook and while it can be worn without the ear hook, it fits more secure with it. The thin wire hook isn’t cumbersome and not very noticeable when worn. The H680 was comfortable to wear but after about 30 minutes, I began to feel the weight of the headset. The headset comes packed with standard features including muting calls, rejecting calls, last number redial, and voice dialing (dependant on your phone’s features). 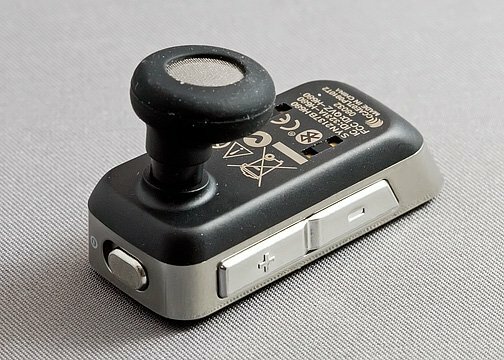 A small LED indicator light is embedded just beneath the call button and combined with various audio tones it alerts/confirms users of functions. It is a very discrete light and if you prefer, it can be disabled. Having to charge the headset with the cradle does restrict your charging options but battery life is reported by Motorola to be up to 8 hours of talk time and 8 days of standby time. This should be ample power to get you to your destination or last a full day at work. 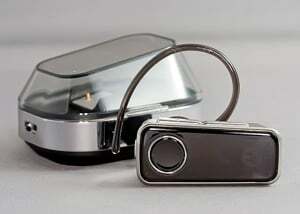 The Motorola H680 is a solidly built mini Bluetooth headset with equally solid performance. The headset has clear reception with the phone and call quality is amongst the best out there. The only downside to this device might be its weight. It’s strange to consider something that weighs less than .5 ounces as being heavy but the H680 is twice the weight of other popular mini headsets. 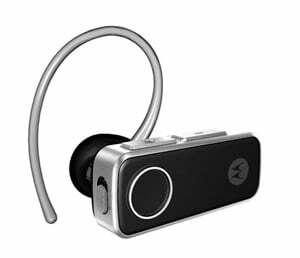 Regardless of the weight, if you are looking for a quality, mini Bluetooth headset, the Motorola H680 ($59.95) should make your short list.